Martin Weiss from moneyandmarkets.com writes today.. In a debt crisis, Washington, Wall Street and European governments still seem to think that the only way to “restore investor confidence” is to pump in massive amounts of rescue capital, bail out the sinking ships, and plug the biggest leaks in the system. But they accomplish little more than spreading the bad debts from one place to another. And recent history has proven, ad nauseam, that the relief they provide is pitifully short-lived … while the toxic material they spread is inevitably lethal. Bankrupt subprime lenders were rescued by mortgage giant Countrywide Financial in 2007 … Countrywide was rescued by Bank of America in 2008 … and BofA itself needed an emergency bailout by Uncle Sam in 2009. Similar sequences of big-fish-eat-small-fish contamination abound with the likes of Washington Mutual, Merrill Lynch, Citigroup, JPMorgan Chase, and many others. And still today, we see Fannie Mae, Freddie Mac, and the FHA taking over 90 percent of the entire U.S. market for mortgages … while, at the same time, we see the Federal Reserve and U.S. Treasury providing 90 percent of the financing. Ditto for companies and governments all over the world — not just in weaker economies like Greece, Italy, Portugal, Ireland, and the UK … but also in supposedly stronger ones like France, Germany, and even Switzerland. Pattern #1 The stampede to risk is a herd phenomenon. When the Fed pushes interest rates down to practically zero and when Uncle Sam virtually guarantees a failure-free environment, the Garden-of-Eden illusion captures nearly everyone; nearly all players are enticed by the forbidden fruits of risk. This is why every major equity mutual fund, commercial bank, brokerage firm, and U.S. household got scorched in the Tech Wreck of 2000-2002 … and were burned even more severely in the Housing Bust of 2006-2009. This is why state retirement funds like CALPERS, supposedly conservative banks like the Union Bank of Switzerland, and even government-sponsored agencies like Fannie Mae also got killed. Pattern #2 Greed breeds corruption. To keep the party going, companies and governments dress up the numbers, hide the facts, or simply lie through their teeth. In the years leading up to the Tech Boom, dot-bomb companies padded sales reports, created phantom capital, disguised costs, and then, to add insult to injury, convinced the world that profits were a non-issue to begin with. An estimated 31 percent of companies listed on the NYSE were suspected of manipulating their earnings reports. Nearly all “buy” recommendations by Wall Street research analysts were bought and paid for by the companies being recommended. In the Housing Boom-Bust, the lying was even more widespread. All major Wall Street firms conspired to create fictional market prices for “structured securities” based on shaky mortgages. And all three established Wall Street ratings agencies joined the conspiracy by assigning triple-A ratings to the grossly overvalued, high-risk securities. Meanwhile, chief executives of Fannie Mae and Freddie Mac, financiers for much of the mortgage industry, repeatedly swore before Congress on a stack of Bibles that their books were both clean and strong. They were neither. Pattern #3 Inevitably the truth is revealed, setting investors on a selling frenzy. Like predators, they first attack the weakest, at the periphery of the herd. In the Tech Wreck, investors first struck the obviously weakest lambs — companies with near-zero earnings and sky-high P/Es like Drugstore.com and Homestore.com. Then they went after bigger targets like Amazon and Yahoo. Established, brick-and-mortar technology companies said they were above the fray and immune from the contagion. But soon, they, too, came under attack. Before investors were done selling, Yahoo had crashed 97 percent; Amazon, 95 percent; Homestore.com, 95.5 percent; and Drugstore.com, 99 percent. Even big names like Dell, Microsoft, and AT&T shed hundreds of billions in market cap. A half decade later, we saw the same pattern in the Housing Bust. Peripheral subprime mortgage lenders were the first to feel investors’ wrath. But the industry said the “crisis was contained to a small niche,” and their regulators agreed. Next, big mortgage lenders like Countrywide got slammed — and again, “containment” was the watchword. Soon, all companies in the housing sector were slammed … and even as Washington and Wall Street were insisting that it was “exclusively a mortgage crisis,” the virus enveloped the ENTIRE financial sector. Nearly all had joined the high-risk stampede, pulling millions of investors into the fold. So it stands to reason that nearly all were vulnerable to the contagion, when investor greed turned to fear and buyers became sellers. Pattern #4 The bailouts merely helped spread the rot. Bailouts, previously reserved strictly for unique emergencies, soon became the norm. Yes, each successive bailout deal was typically larger than the previous. And yes, each was hailed as the “end-all solution” to the crisis. But in reality, the deals did little more than spread the toxic material up the food chain — from niche players to Wall Street giants … and from Wall Street giants to sovereign governments. Ultimately, however, as Mike Larson eloquently explained, ALL of the bailouts fail the most basic of smell tests. Reason: The debts stink up the joint. Investors hear rumors of big blunders. And they feel it in the gut when numbers don’t add up. That’s why they dumped tech stocks in 2000; that’s why they dumped bank stocks in 2008. The most important pattern of all: Until and unless excess debts are liquidated, the disease cannot be subdued. It will merely return at a different time, in a different form. Next to feel the pain: Sovereign nations! After nearly three years of escalating government bailouts, it should come as no surprise that the biggest debtors of all — and the biggest warehouses of bad debts — are now sovereign governments. Sovereign governments across Eastern and Western Europe following a similar path. The Obama administration has just presented 10-year budget estimates based on assumptions that are SO optimistic, even giddy Wall Streeters don’t believe them. Spain, Ireland, Portugal, Italy, and the UK have committed even more serious accounting sins. Greece even hired Goldman Sachs to help break Eurozone rules and cover up its excess debts, the New York Times revealed yesterday. Greece, the weakest link on the periphery of the Eurozone, was the first victim. And in New York this past week, even the United States Treasury felt the sting when its auction of Treasury notes bombed. The big irony is that Germany, France, and other supposedly “stronger” Eurozone members know that if they bail out Greece or others, they, too, could become the next victims. But rather than bite the bullet and face the heat, they are choosing the same path as Bank of America with Countrywide and Uncle Sam with BofA. They will bail out Greece. They will absorb the bad debts. Then they will pray investors suddenly forgive and forget. But the hard evidence already proves their prayers are falling on deaf ears. Investors are not forgetting! And they’re certainly not forgiving! Global investors know that all investments — no matter how safe on the surface — involve some measure of risk. And they know that all governments — no matter how powerful and rich — could, in extreme circumstances, default on their debts. So to protect themselves from the downside, they buy government default insurance … which, of course, comes with a cost. If the consensus of market opinion leans toward a higher default probability, the cost of the insurance rises. If fears of default are minimal, the cost of the insurance falls. So these insurance contracts — called “credit default swaps” — act as a pretty accurate gauge of investor fears and behavior. The cost of insuring Greek government bonds has catapulted to nearly DOUBLE the levels seen at the peak of the last debt crisis, receding only marginally when Eurozone countries vowed to stand behind Greece last week. 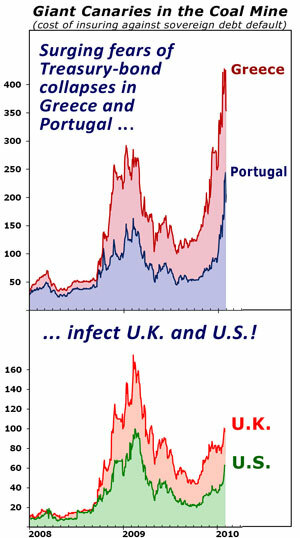 The cost of insuring Portuguese government bonds has also surged far above the peak crisis levels of 2009. The contagion has infected the UK, where fears of default now match those associated with the U.S. in the thick of our bailout madness. And the fears are ALSO returning to the U.S. itself, where the cost of insuring against a U.S. Treasury default has jumped dramatically in recent weeks. Although still not at new all-time highs, they now exceed the peak levels seen in the 2008 debt crisis — a harbinger of sadder days ahead. These are giant canaries in the coal mine. As Moody’s warns, unless the U.S. government can somehow perform miracles — a revenue bonanza or gut-wrenching spending cuts — its triple-A credit rating will be in jeopardy. I don’t expect a U.S. default, and I believe anyone betting on it is throwing money down the drain. But if the Wall Street rating agencies don’t act to downgrade U.S. Treasury bonds, the market will. Net result: Far higher borrowing costs not only for Uncle Sam, but for every borrower in the world. If you own long-term bonds of any stripe or color, sell them now. Don’t wait. If you’re overloaded with U.S. stocks, cut back drastically. We think that whatever the daily volatility of the precious metals prices is, you are safer with your money in something real, tangible, and that can’t be printed or devalued overnight. If and when it gets to that, as they devalue the paper, the value of your Gold & Silver will increase incrementally against the falling paper / stocks / bonds etc, and you don’t have long, this has started already, and can come very quickly now..
..but it will still come “Out of the Blue” (LOL!) to the sheep-like masses who will get get herded into the slaughter chamber yet again. Time to buy Gold & preserve your wealth? Martin Weiss is one of the very few who is not taken in by repeated oaths about raising taxes and paying back debt – it has never happened, why should it now? There will soon be widespread government default in OECD countries, and eventually China will crumble as well, its statistics about as reliable as Greece’s if not much worse. Then gold will eventually rise like never before, because we also never had the situation as it prevails since 1971 where not one country is on the gold standard which formerly kept money-printing at least partially in check. thanks for dropping by, and couldn’t agree more. that’s some amazing content you have on your blog there, you need to set up your own domain before you become hugely popular on the Wordpress domain and then wish you’d done it in your own name. and because you’re hugely limited with what the blog can do on there too, compared to self-hosted Wordpress. I’m going to mail you because we can help with this if you want to do it. Thanks for posting this info. I really think the rot is continuing too. The housing and business real estate markets are set to implode the gov is the one wanting to bail them out. I can’t figure out why people think debt is good and creating more of it is going to save us. It’s insane to me. the same (above your comment) applies to you too, you should be on your own domain & hosting. shout me back if you want assistance with that.